What are Amazon’s Sponsored Products Ads? This is what makes them such an effective tool for boosting sales and expanding your readership, even if you write in a crowded genre. Sponsored Products ads are also cost-effective. Since they’re cost-per-click, you only pay when a reader clicks on your promoted book. 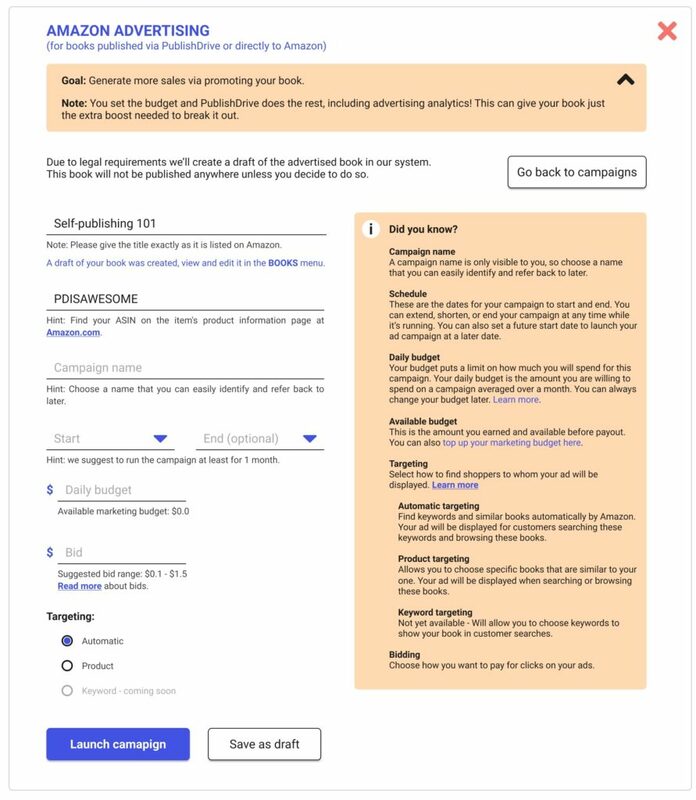 Our new built-in tool makes it super easy to get up and running with your first campaign. You’ll need to fund your marketing budget before getting started. The process is simple: you can either make a deposit with PayPal or a credit card, or you can transfer money from your book earnings. Next, select the book you want to promote. If you’re using the beta-testing version and you don’t distribute to Amazon via Publishdrive, upload your book as a draft. Don’t worry, it won’t be published. 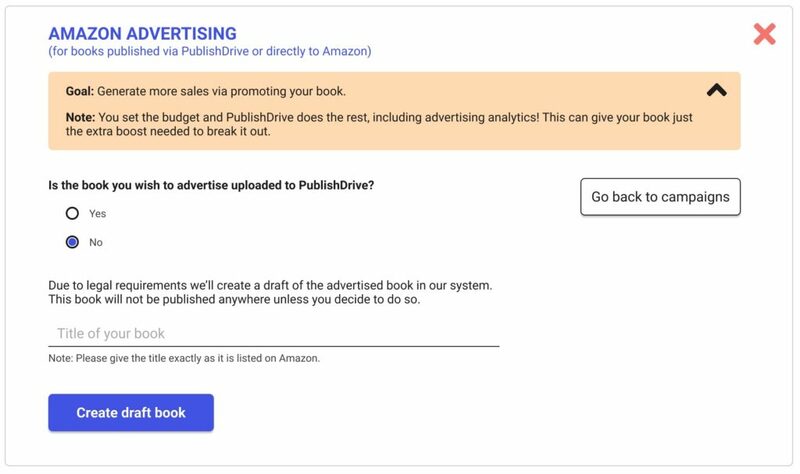 This just gives us the information needed to link your ad to the ebook’s live product page on Amazon. Enter the campaign details, such as the start and end dates, daily budget, and bid. Hit “Launch” and we’ll handle the rest! You can edit your campaign details anytime, and you’ll have access to robust, downloadable sales data. The live analytics, which includes different types of performance indicators, will make it easy to check your campaign’s progress at a glance. 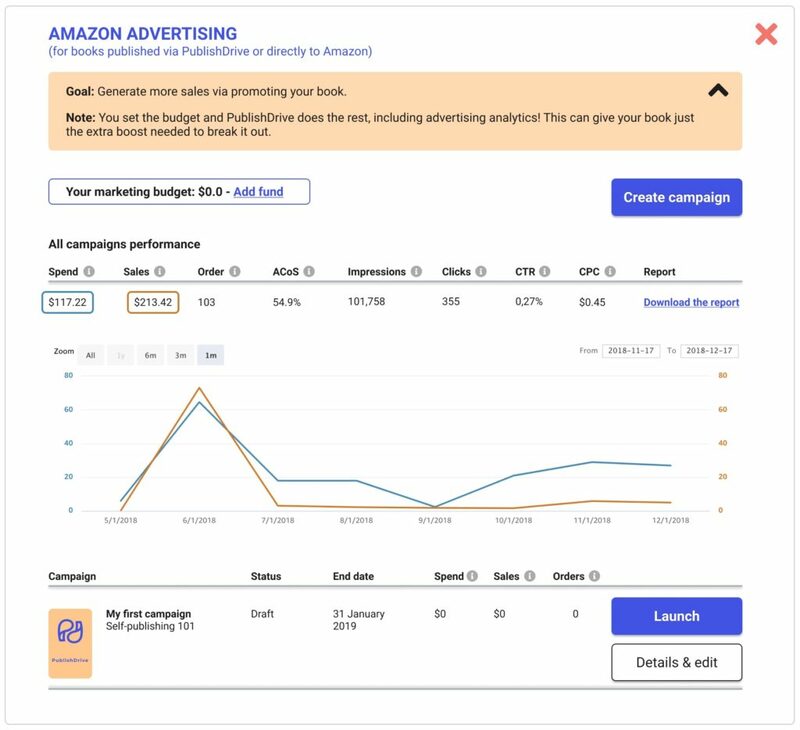 Authors who launch Amazon advertising campaigns via PublishDrive can also unlock enhanced analytics on their Sales Chart. The enhanced analytics shows exactly when the campaign began, so authors can see their before-and-after earnings. Try Amazon Advertising for Ebooks Today! We can’t wait to see how authors will benefit from this easy-to-use advertising feature. Try it out today! The new feature can be found under the Marketing section of your PublishDrive dashboard. For more detailed information, feel free to review our Help Center article. And if you enroll in our Subscription Pricing option, you’ll also receive a $50 Amazon advertising credit that you can immediately use to get started. P.S. Don’t forget that our built-in marketing suite includes several free tools! Learn more about our free ebook marketing tools here.